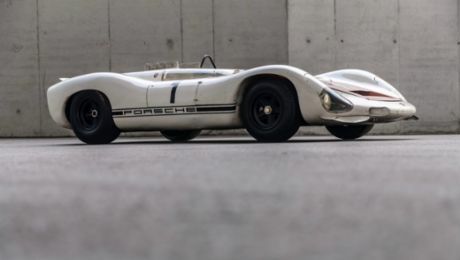 The Porsche Museum is celebrating "70 years of the Porsche sports car" at this year's Retro Classics exhibition. Every hour at the Porsche stand, visitors are invited to experience a 15-minute journey back in time through the history of the Porsche brand. A selection of special sports cars form the centrepiece of the guided tour, in which Porsche presents the Type 915 as the study for a Gran Turismo based on the 911. This unique vehicle was constructed in the autumn of 1969 under the 915 type designation. With its wheelbase extended by 350 millimetres, the 915 was designed to offer more legroom for the rear passengers. A 356 Speedster from 1955 also features in the tour. This lightweight and affordable sports car was developed especially for the US market in the 1950s. A core theme of the Porsche exhibition stand is the development of turbocharging. The brand’s pioneering work in this field is illustrated by four sports cars spanning several decades: The Porsche 961, a race track version of the 959 super sports car, demonstrated the reliability and performance of innovative technologies during the Le Mans long-distance race in 1986. The year 1991 saw the launch of an exclusive 944 Turbo Cabriolet with an output of 250 hp; by the end of series production, only 528 of these sports cars had been built. In 1997, Porsche Exclusive offered a performance-enhanced variant of the last air-cooled 911 Turbo, featuring a 3.6-litre flat engine with an output increased from 408 hp to 430 hp. The spectacular climax of turbo development is marked by the 911 GT2 RS, which holds the lap record for series-production vehicles on the Nürburgring Nordschleife at 6:47.3 minutes. This high-performance sports car with rear-wheel drive and an output of 515 kW (700 hp; Fuel consumption combined 11.8 l/100 km; CO2 emissions 269 g/km) is the fastest and most powerful 911 with road approval produced to date. Porsche Track Experience offers this vehicle as an option at its driving events and is presenting it at the Retro Classics exhibition. Two-time World Rally Champion Walter Röhrl along with both Porsche racing legends, Hans Herrmann and Kurt Ahrens, are expected at the Porsche stand for an autograph session on Saturday, March 24 at 2:00 pm. Walter Röhrl has worked with Porsche as a representative and developer for 25 years. Hans Herrmann, who celebrated his 90th birthday in February, is one of the most successful works racing drivers at Porsche AG with more than 80 overall and class victories. Kurt Ahrens won the long-distance races in Zeltweg (1969) and at the Nürburgring (1970) for Porsche. Le Mans winner Marc Lieb and Porsche works driver Dirk Werner will also be available for autographs on Saturday March 24. Hans Herrmann and Kurt Ahrens will attend the Porsche stand as guests again on Sunday 25 from 2.00 pm for a further autograph session alongside Porsche works drivers Laurens Vanthoor and Richard Lietz. What’s more, car enthusiast and Porsche collector Magnus Walker has announced that he will be at the stand on Saturday March 24 at 4.00 pm to autograph his book entitled “Urban Outlaw: Dirt Don't Slow You Down”, published by Delius Klasing. 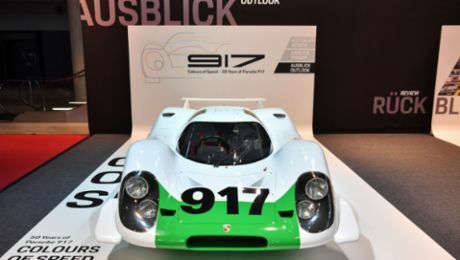 With virtual live tours and other formats, the Porsche Museum is picking up the pace with its digital offering.